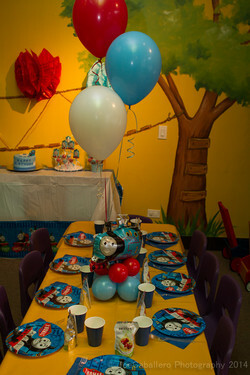 Max is a devoted Thomas fan and his parents were looking for the ultimate Thomas and Friends celebration to ring in his big number three! Baker, Joanna, designed a delectable cake and sweet table. Balloon designer, Rosie, brought the helium train magic to the table. Graphic designer, Claudia, created a custom banner (background above) and gift bags (background below). Max's mom designed this adorable snack train. And between imaginitive play and bouncing around the bubble machine, the kids and adults all had an absolute blast. Happy Birthday Max! Thanks for celebrating with us!